When you hear small batch artisan, take note. It might mean something special. 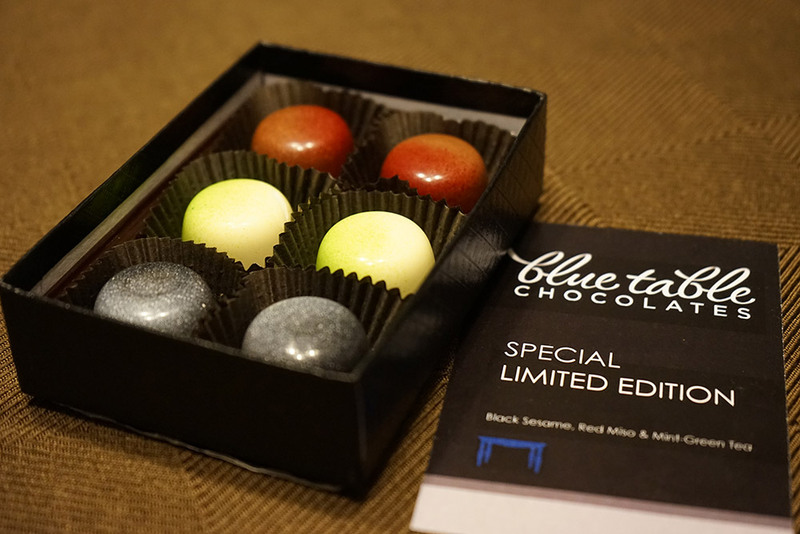 If you haven’t yet had the pleasure of trying Blue Table Chocolates‘ handmade truffles, get on it. I thoroughly enjoyed the little box of “Japanese Collection” truffles made in partnership with the staff from Sato. Black sesame, red miso and mint-green tea: all so different, yet collectively delicious. The black sesame was deep and nutty, while the red miso was smooth, milky and a touch umami. The mint-green was unlike the rest because it was white chocolate; I loved the filling, but the white chocolate was a bit sweet for my taste. I thoroughly enjoyed the array of flavors presented. I hope you’ll pop by Sato for a meal soon. Grab a box of chocolates to bring home before they’re gone. This is amazing. I love Nutella, Lidia Bastianich and Mario Batali when they combine forces. See you this summer, Nutella Bar. In the meantime, I’ll read the menu, which is simple and no doubt delivers on tasty vehicles from which to enjoy Nutella. How fun is this map for finding great coffee in NYC? Love it. My husband is really in the mood for beer bread, so I’ll be raiding the wine refrigerator of some good beer to make that this week. (Yes, we store beer in our wine refrigerator.) So far this looks like a decent recipe as far as being straightforward. I’m shocked how hard it’s been to find a humble, natural recipe for beer bread online. Apparently there are bagged mixes for beer bread a’plenty. I also have a couple in recipe books on my shelf, but if you have a recommendation, please share! I look forward to checking out “Smashing Plates,” by Chef Maria Elia. Mix 3 cups flour with 1/4 cup sugar, 1T baking powder, and 1 t salt. Add 2 t of melted butter or oil and 12 ounces of beer and combine into a lumpy batter. Bake in a greased loaf pan at 350 for 45 minutes or until a straw comes out clean. It’s easily tinkered with — swapping in brown sugar, changing up the oil/butter, adding nuts or berries, and topping with oats are things we used to do. It all can change to complement the beer you use. And that’s how I started making bread!